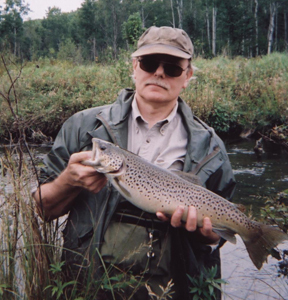 I remember a few years back fishing with Feral on the Pine and watching him catch trout after trout. I tried a variety of lures including what he was tossing but caught zip. If you were to follow either of us up a trout stream there would be very little to tell us apart. 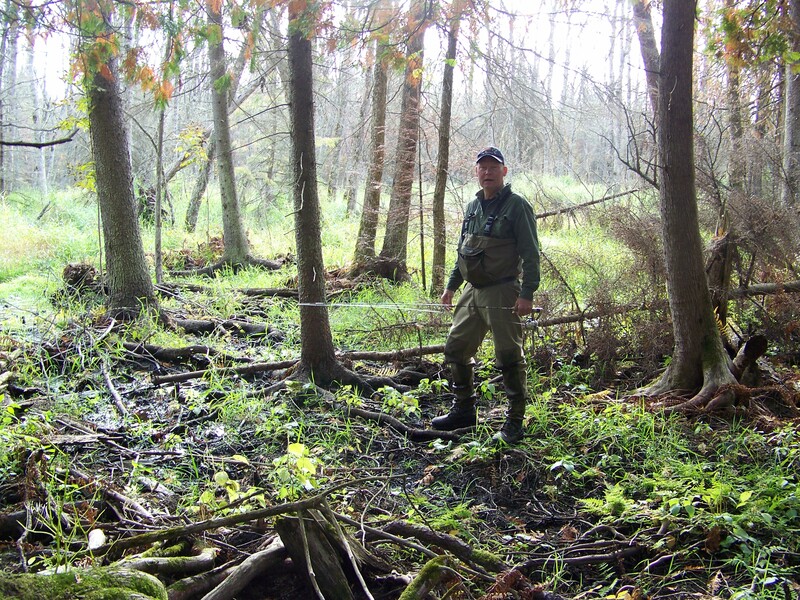 We use the same underhand flip cast to get lures next to the banks and under low hanging brush. 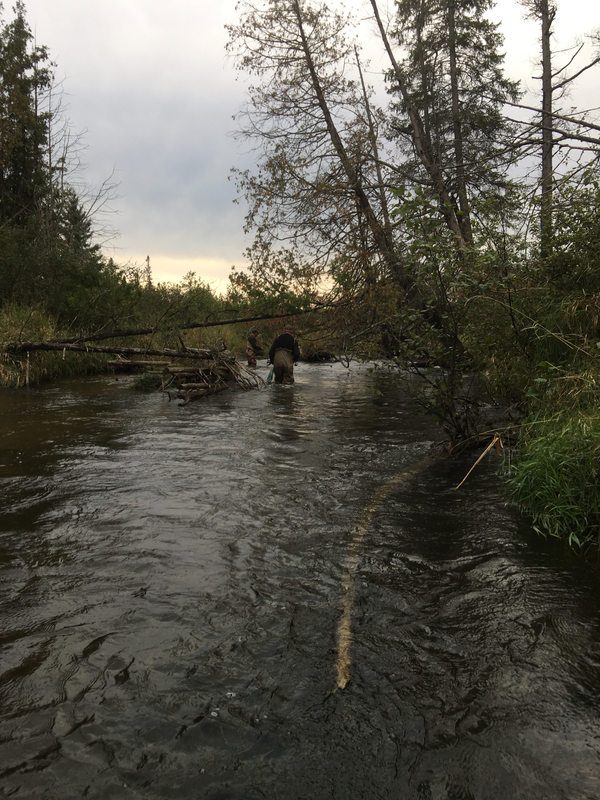 We likely follow the same path up the stream – crossing the stream in the same places, making generally the same casts. We move about the same speed – meaning we take a similar amount of time on a bend or piece of cover before deciding to move on. We both wade quietly. We toss the same lures including a variety of minnow baits from various manufacturers as well as spinners and what not. So when one of us catches a lot of fish and the other is relegated to watch – there must be something going on. Our roles were reversed at our fall trout camp this year. ( see 2012 Trout Camp Closer for more photos) Feral and I decided to fish a remote spot on the Pigeon we call bear country because of the difficult walk in through tangled blow downs, bogs, beaver slashings, and eye level branches designed to remove your hat or smack the guy following. Thick stuff where you can imagine a bear rising up to say hello with a loud grunt after you step on his toe. I fished this spot alone occasionally but its nice having some company during the walk in since the conversation is two-sided and there is always the chance of running into another fisherman who may not be talking to himself. When we reached the stream Feral let me take the lead on a wide slow bend with a grassy undercut bank. I made two casts and watched a V- wake come back with the lure. He took it hard and I was on to a twenty incher which put up a good battle. 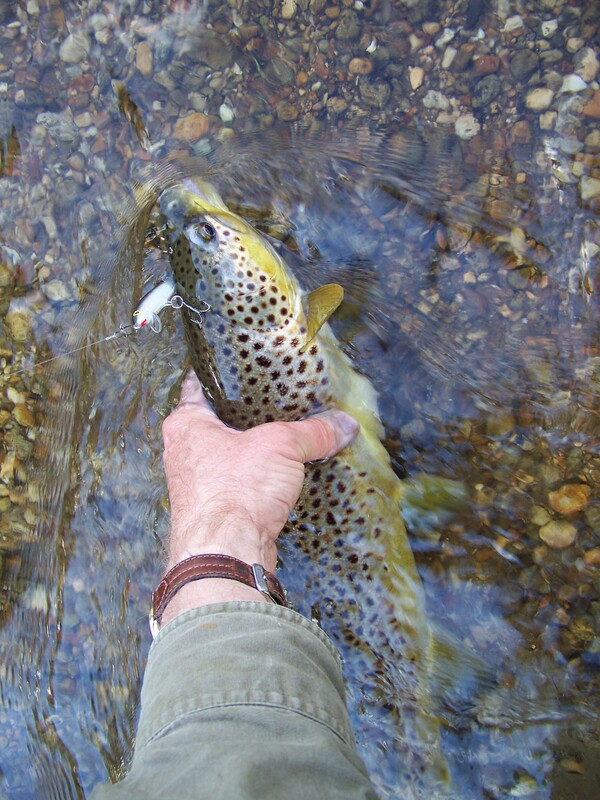 Feral was kind enough to de-hook and release the brown trout and that set the stage for the morning. He moved into the lead and right off a similar size fish followed his lure back but didn’t strike. 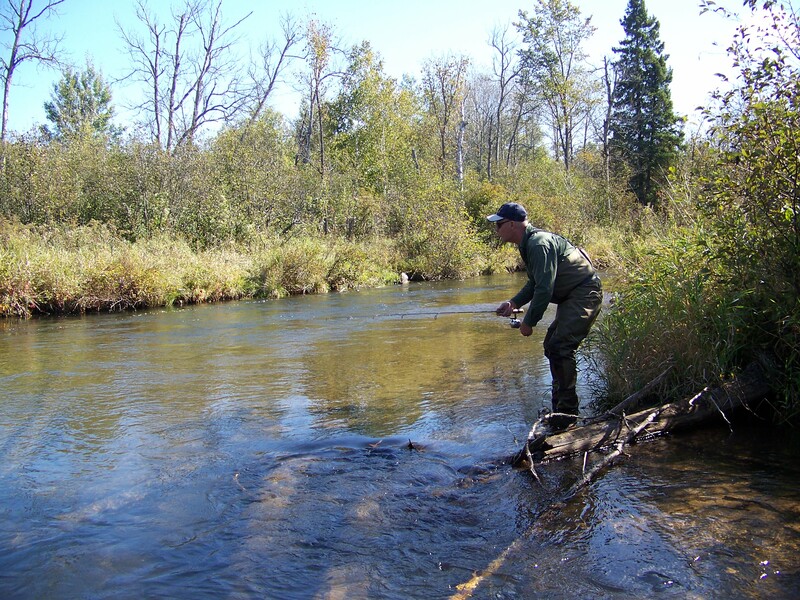 He didn’t rest the fish at all, which surprised me, but continued casting and moving upstream. 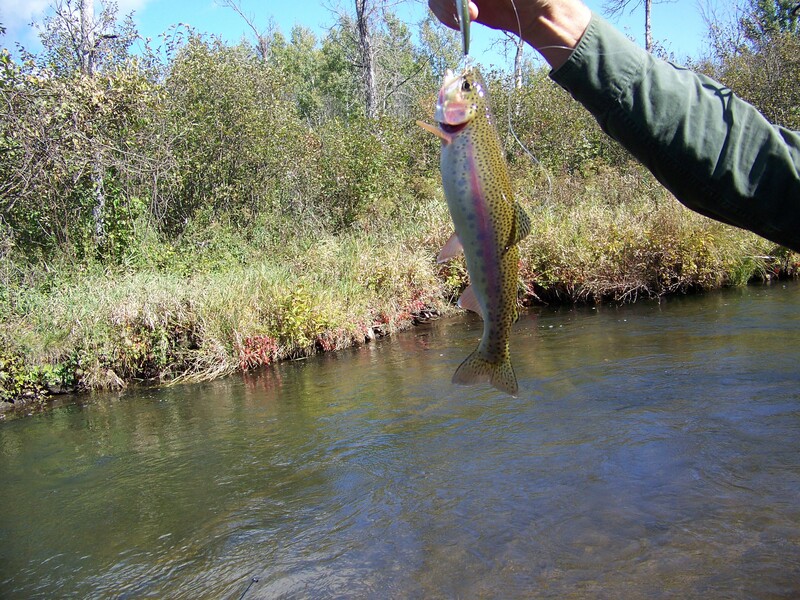 We each caught some smaller fish and pretty soon we came to a familiar bend which I almost didn’t recognize. We carefully waded along the shallow outside of the bend. The inside had the faster water, a deep trough, and buried log cover and frankly it didn’t look so great mainly because the sun was up and the stream was clear. There was a little cut-in at the inside bank and I watched Feral work it with no result. 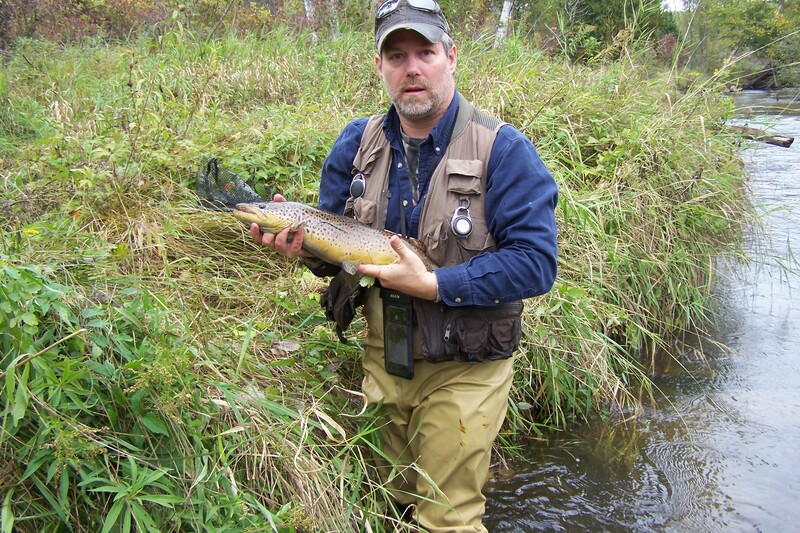 I was close behind him and made almost the same cast thirty seconds later and was rewarded with a second twenty inch brown. Feral watched me make the cast, saw the lure, and saw the trout take it. 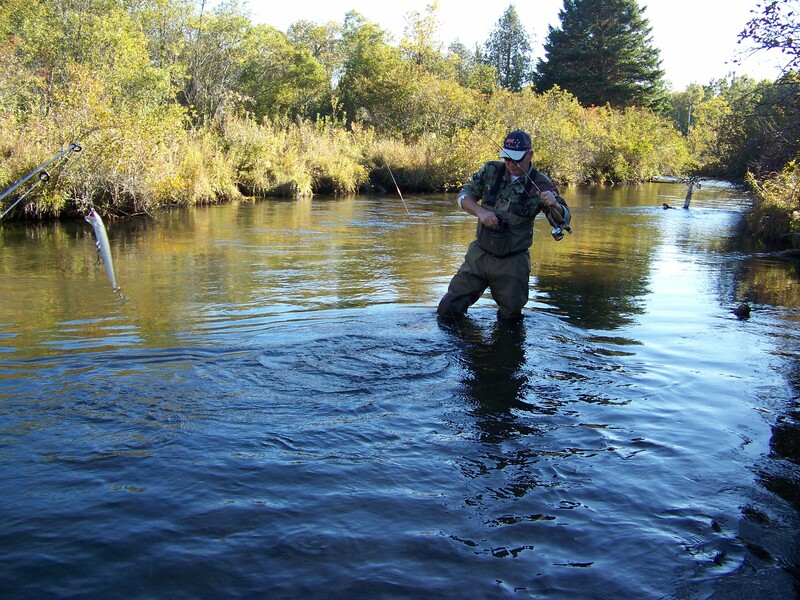 If that were the first time it happened on this trip he would have shrugged it off as luck, but I had done the same thing the previous day on the Sturgeon – caught a twenty incher following behind him. I offered to take the lead so he could catch some fish, which was funny at the time. Lesser men would complain but to Feral’s credit he asked: What are you doing different? 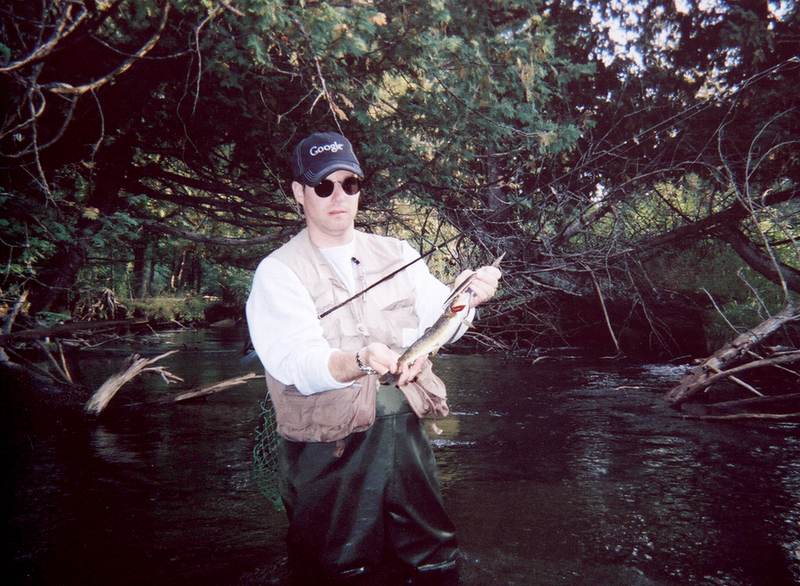 And that must be it – I was doing something a little different because I was casting the same lure over the same water. I couldn’t explain it at the time but maybe it was the retrieve. By twitching the pole as I wound the lure back I imparted a more injured look to the minnow lure. I learned this trick bass fishing a top-water plug called a Pop-R which is the only way to fish that bait. There’s a rhythm to it. I think Feral saw what I was doing and I don’t know if he emulated it, but at the top of the bend he caught a rainbow trout about twelve inches. 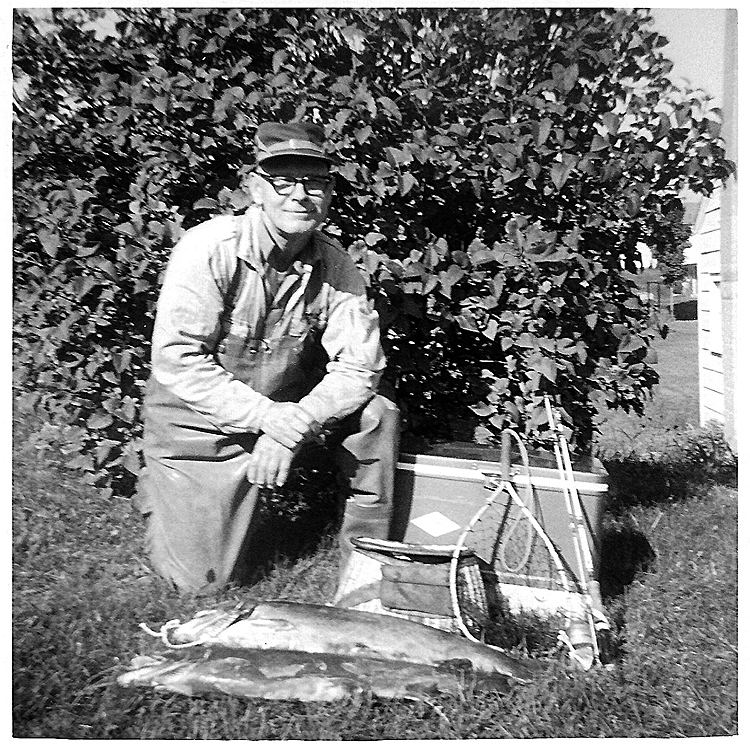 It was a beautiful fish but I know exactly how he felt because I sometimes think about that trip up the Pine where he was catching the eighteen to twenty inchers and I was lucky to catch a small keeper. Fortunately for Feral, he’ll always be able to remember this trip up the Pigeon since his fishing buddy has a blog. 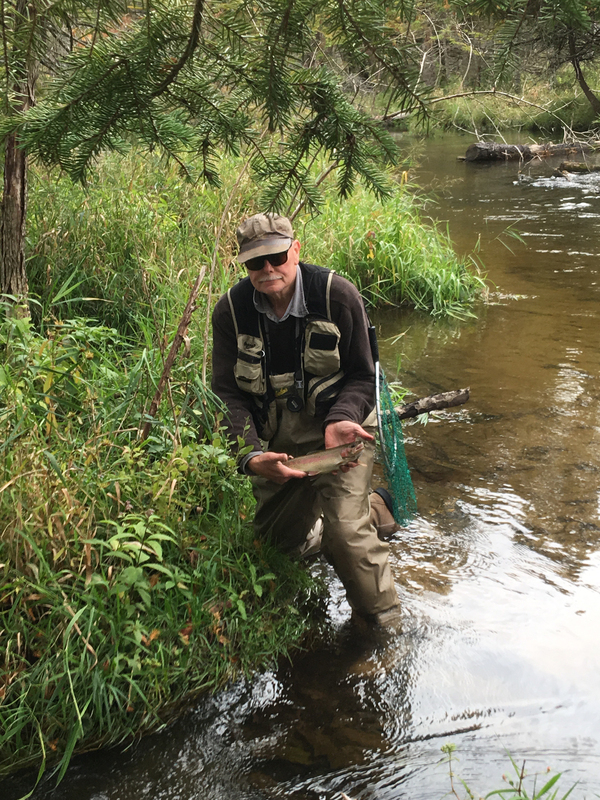 Jake Lucas, my grandfather and fishing mentor to family and friends, kept a written diary of his daily trout catches on Michigan streams from 1954 to 1976. 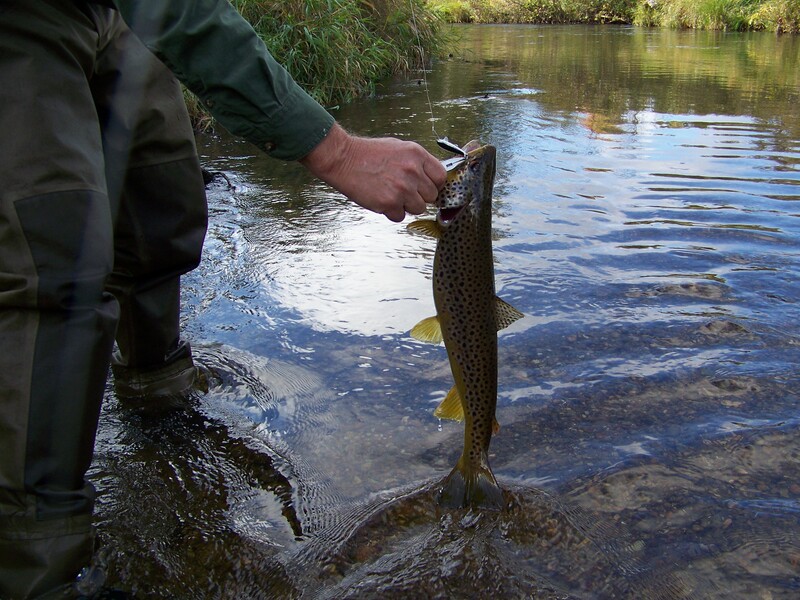 The diary includes place, weather conditions, baits or lures, largest fish, total fish and other notes. 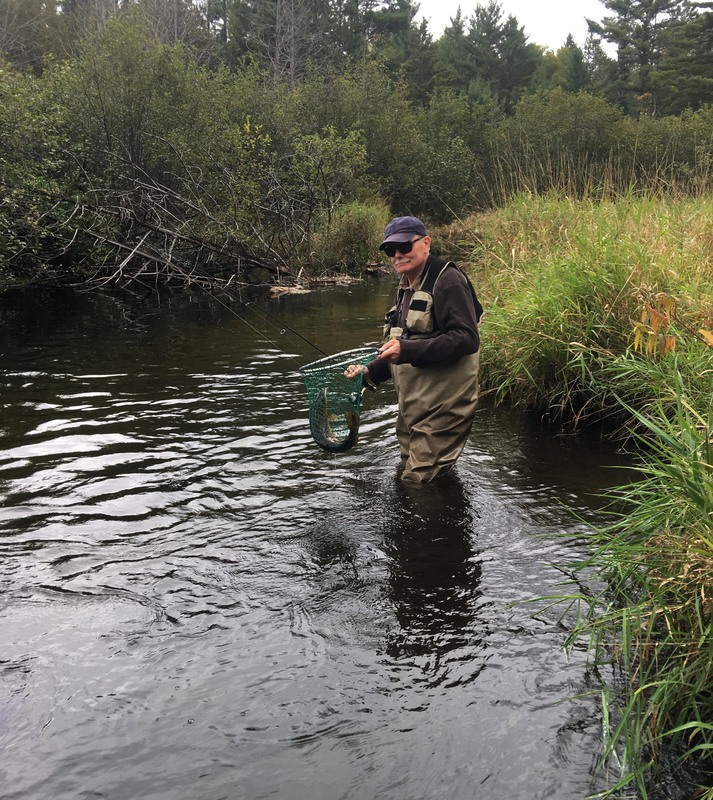 The diary may represent the only existing record of the trout population of brook trout, browns and rainbows (not to mention steelhead) in many of Michigan’s noted trout streams though this time period. 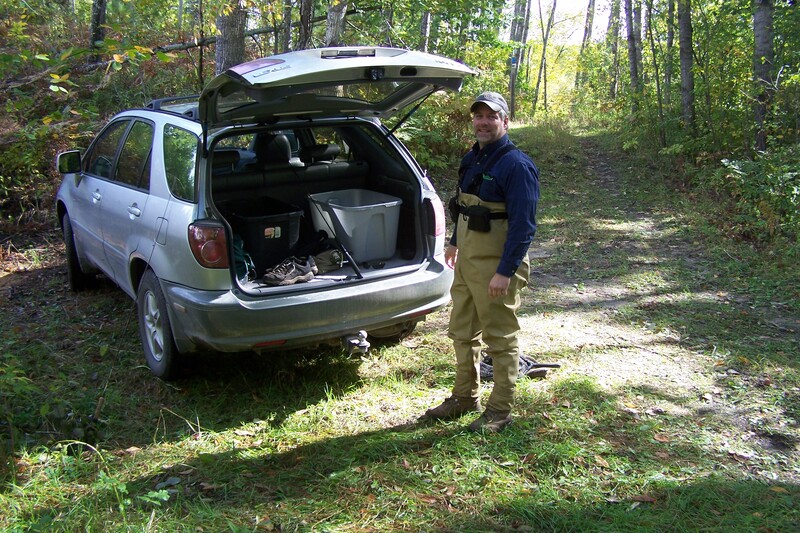 While the diary is in spreadsheet format, he was inspired to add this account after a couple great days of fishing. 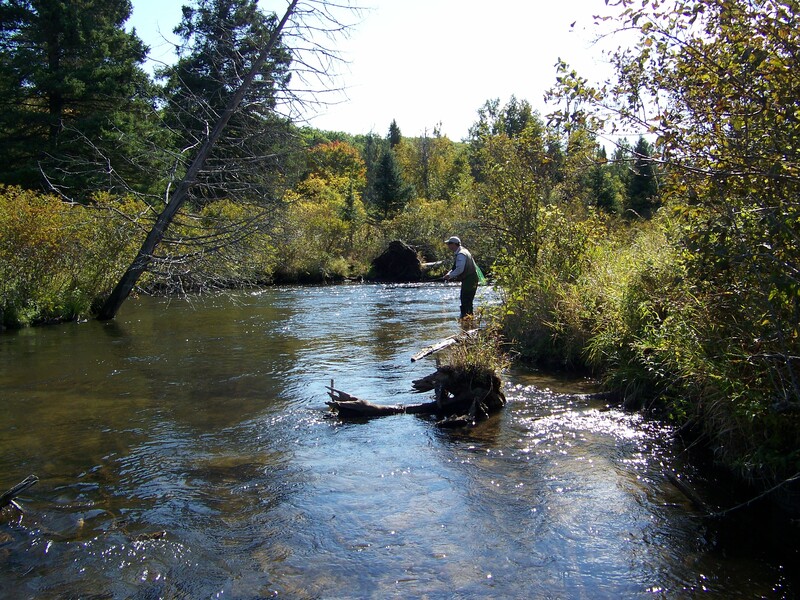 Fished Little Manistee above public fishing site at Indian Club Bridge. Hooked a large RB (rainbow) in a deep run by some stumps on a curve. He jumped and then he tore downstream for 40 or 50 yards. I turned loose the reel and he unwound line from the reel faster than anything I have ever hooked. 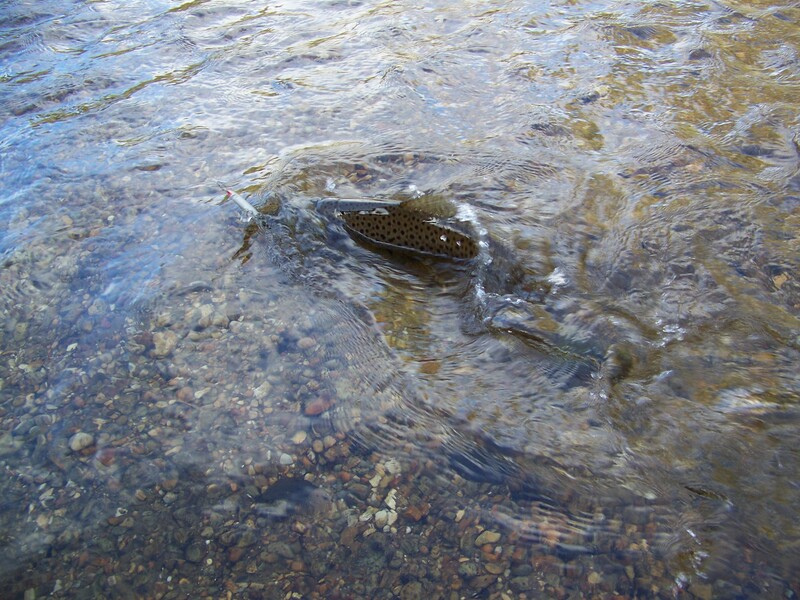 He turned into the slow side of the stream and moved up into a drift and got loose. Had a strike by another RB in front of the drift. Hooked another one about 20 feet in front of the same drift. Played it until I thought I could get it into my net. Had it close in front of me and started the net up it’s tail – then he turned head first into the net and a hook caught the net and the fish pulled loose. I was ready for a straight jacket. Boy: I was mad and disgusted. Hooked another one in a run of water by some raft type cover. 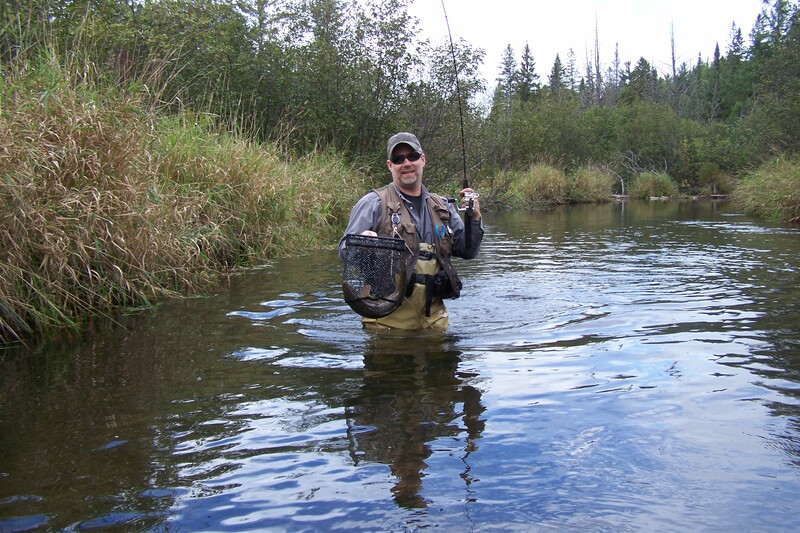 He was smaller than the other two and I finally got him into the net downstream about 75 or 100 yards. It was a 27 inch male. I took it back to the car and met Doc (Dr. Pratt) at about 11: AM. He had an 18 + a 12 inch Brown. In the afternoon went back to the same area (points 3 to 5) caught another 27 inch female, + one 20 inch male and had another good one and my line broke inside the reel because of a grooved pickup pin. Hooked a big one and he broke my line so quick I didn’t have a chance. I think the grooves in my rod tip cut it. Hooked a big one by the tail and lost it. I just could not wear it down. He got off after going downstream from me. 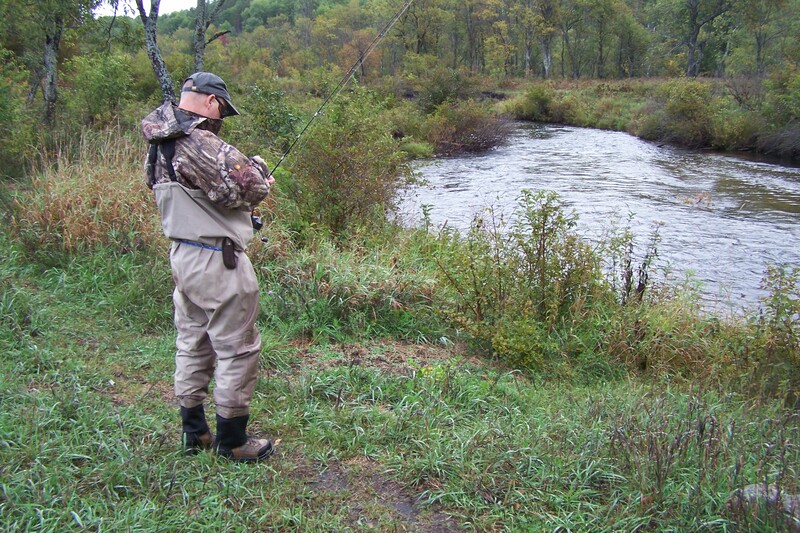 Hooked a really big one but he went downstream and just dogged it in the middle of the stream. Felt like I was hooked to a snag because I could pull hard and he would just stay there. 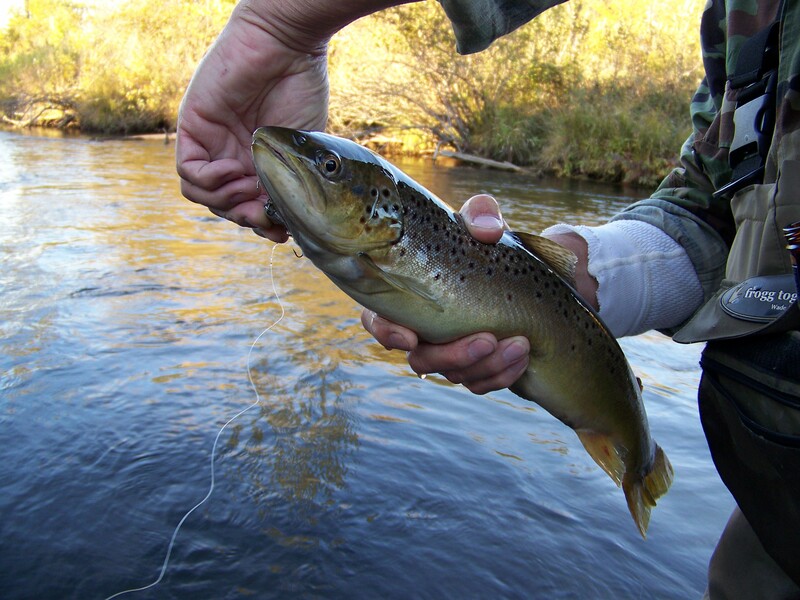 Finally he bore downstream rolled on the surface and the hook came out. I never saw anything to beat this – what it takes Jake has and aplenty. 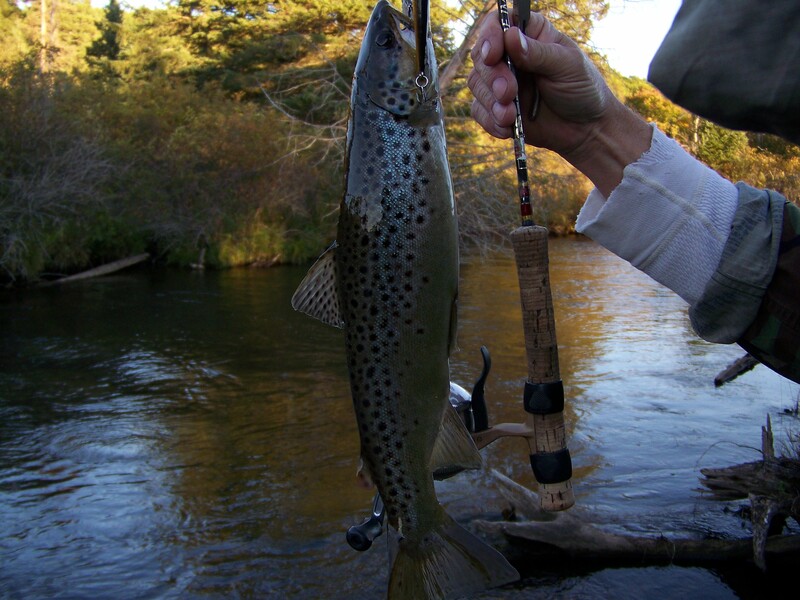 Accuracy and handling and the lure in the water tell a tale and my experience was worth every cent – a real pleasure.